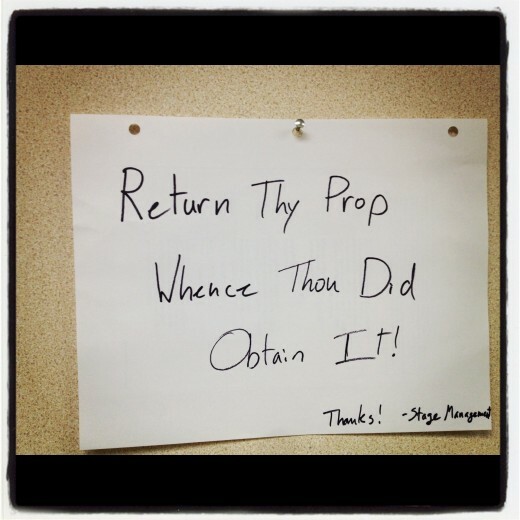 Originally posted on the Livermore Shakespeare Festival Blog. Yeah, our Stage Management team was the best. Let me tell you about rehearsing and performing two shows. At the same time. There aren’t many companies in the Bay Area that rehearse and then perform more than one show at a time, using the same company of actors in both shows. It’s a huge undertaking, and my mind reels at the organization I witnessed every day from our incredible production team (and then I completely black out when I try to comprehend all that happened outside of rehearsals). Many actors overlap projects, going into rehearsal for a new project while in performance for the last one. And while that can be grueling, it’s far easier than what I experienced this summer at Livermore Shakes. We began rehearsal for Hamlet, rehearsing up to 8 hours each day, and one week later we began rehearsal for Merry Wives, splitting the day between the two. For three weeks we rehearsed both shows, then moved into technical rehearsals for Hamlet at night while still rehearsing Merry Wives during the day (are you following this? I’m not even sure I’m following this). 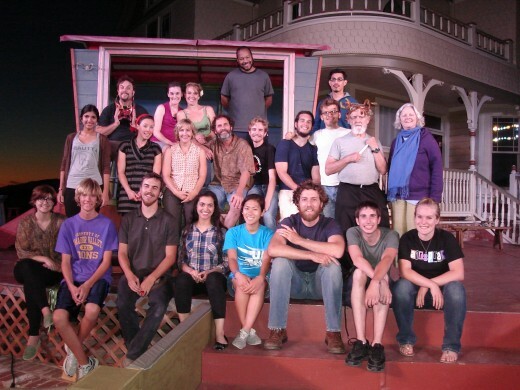 After opening Hamlet we plunged right into technical rehearsals for Merry Wives, and then proceeded to perform both shows for four weekends. All of this around (for many of us, myself included), a day job. 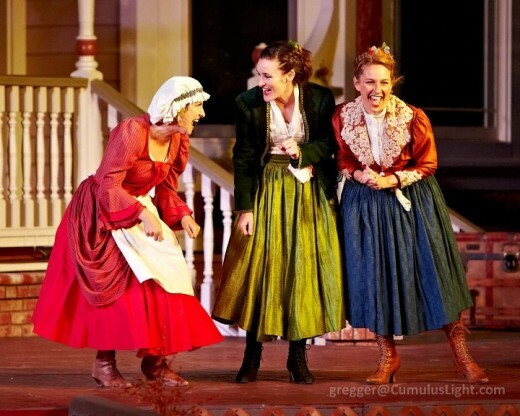 Siobhan Doherty, Elissa Beth Stebbins and Jennifer Le Blanc in The Merry Wives of Windsor. Photo by Gregg Le Blanc. Ophelia and Mistress Ford. A young woman left utterly alone and taking the steep descent into madness. A married woman who colludes with her best friend in gleeful revenge. I cannot imagine a better pairing of roles for a summer like this. Shows work on me emotionally. It takes about a week of pondering and working before I start to see the hallmarks of my character in my daily life, start to notice my personal emotional state mirroring (or at least dipping into elements of) my onstage counterpart. Merry Wives rehearsal started one week after Hamlet, so it’s no wonder that during the first week of Merry Wives I judged myself to be adrift, struggling with text, seemingly behind everyone else, and unable to joke and laugh (Dare I say “be Merry?” I do dare. Because I love puns and parenthetical jokes) with my usual abandon. I was lonely and irritable in a room full of lovely people. But, true to form, about a week into Merry Wives, I felt the silliness and mischief of Mistress Ford begin to work on me as well. Her friendship and ease with Mistress Page helped me open myself to fellow actors offstage, and the music and joy of play worked its way into impromptu break time dance parties and the belting of bad (great? let’s go with great) pop music. At points leading up to the shows I worried that two such contrasting characters and shows would work against each other such that they would flatten each other out, leaving both sort of soggy and leaving me in the middle of the emotional spectrum, pulled back from Ophelia’s grief by Mistress Ford’s glee and vice versa. But in truth, the joy of Merry Wives and the antics therein made it easier to reach into the depths of Hamlet’s tragedy, and I felt safe at each end of the spectrum knowing that I’d shortly be able to return to the other. I was pleased to find that flexing each set of emotional muscles seemed to make the other stronger. 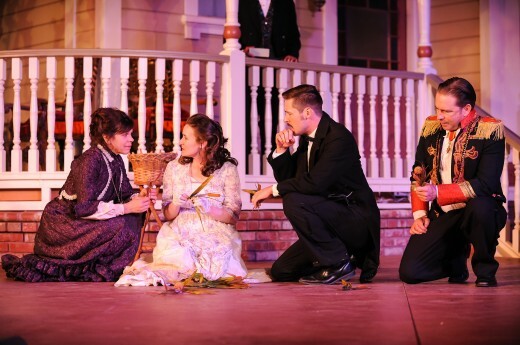 Nancy Sauder, Elissa Beth Stebbins, Joseph Salazar and Michael Storm in Hamlet. Photo by Kenneth Alexander. ening that night. I’m happy (but also a little disappointed – think of the story possibilities!) to say that I didn’t really encounter that. Brush up rehearsals were built into the process to help remind us of the show we hadn’t touched for a while, and a pretty stellar group of folks meant we didn’t hit any major speed bumps. It was, however, interesting to feel the shift between shows. During the first shift or two I could feel my body and mind lagging ever so slightly behind on picking up the rhythm of the new show. As we progressed through the run I was pleased to find the shifts getting easier, and I wished for more weekends and more shifts in order to increase my skill at making the pivot from one show and character to the other. s-during-downtime type friendships. And together we make this thing (or, as is the case this summer, couple of things), and it’s always changing. And sometimes we come offstage sputtering curses at ourselves (or the weather or the bug in the face) and sometimes we come offstage finally able to let out the giggles that have been building up ever since that prop broke or that line was flubbed in a particularly funny way. 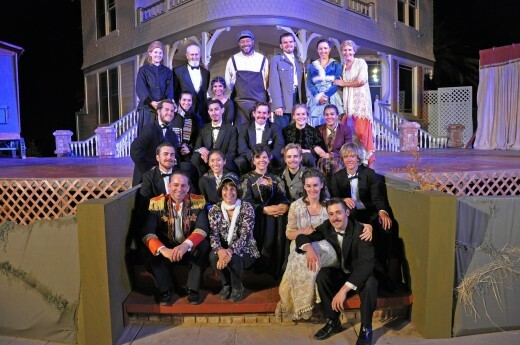 As the Livermore Shakespeare Festival 2012 season is now done. And I marvel at my luck, being able work with such an amazing group of people. And I wonder if I will ever get this enormous opportunity again, to play two marvelous and contrasting roles like these. And I pretend that I’m not already missing these people and the laughter and the vineyard and the characters. I pretend I’m good at endings, and I hope for reunions, and – ah! Here comes the next project with its own challenges and a new cast of characters and a litany of new fart jokes and the ensuing belly laughs.